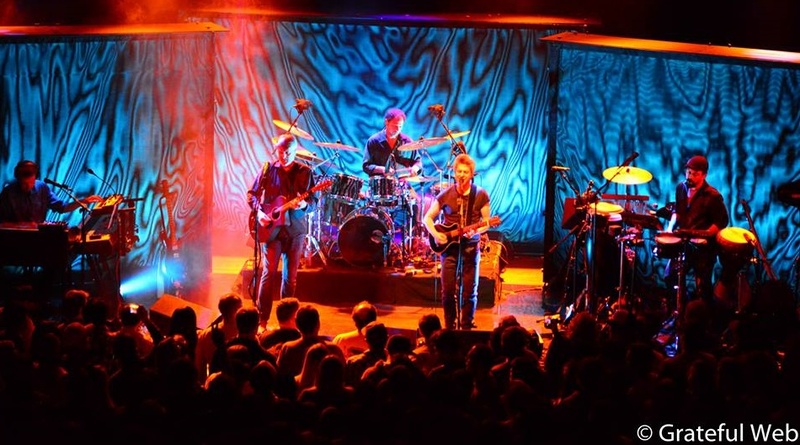 After hanging out with Mike Gordon a bit the night before his show during the Toubab Krewe concert at the Fox Theater, I was more than ready to see his new lineup at the Boulder Theater. I pre-ordered his new album and enjoy listening to it especially on vinyl. Each time I have met him has been a peculiar, but enlightening experience. No one will be surprised to hear that. This time we talked about altitude, Malcolm Gladwell, Shakespeare, music, and what else there is to do in Boulder after midnight. Like a dork, I was wearing his bass strings as a bracelet, but I forgot to ask him where and when the strings were played. I did not know I would be talking with him, but the unlikely meeting was more productive than the last two. It was a fun experience, but just the beginning. The next night Gordo would be taking the stage set up by my friend and tour assistant Andy Cass, former Bassnectar lighting engineer, and they both had new toys to debut for the crowd to participate in. 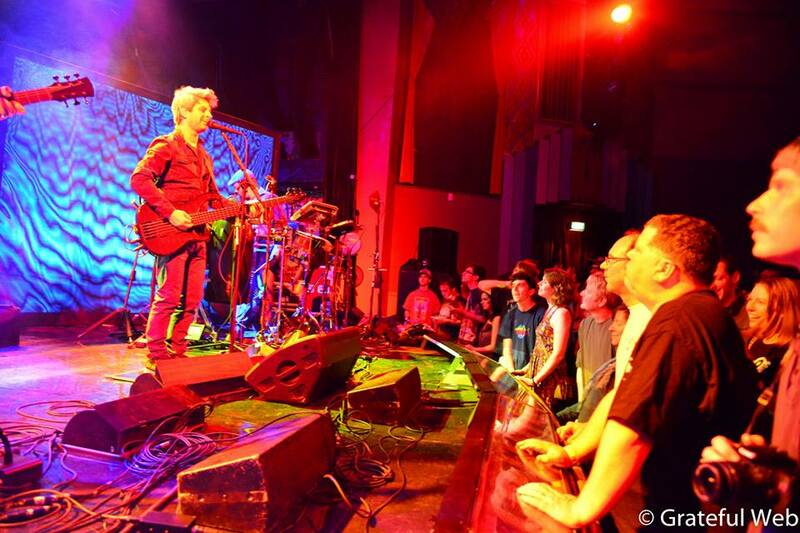 It would not be a Mike Gordon show without a few eccentric surprises, right? As I entered the venue when the doors opened, my friend and Grateful Web creator Mike Moran and I secured a spot on the stage in front of an interactive board set up along the entire edge of the stage. The purpose of it was to play the percussion type piano when it lit up, and the corresponding sound effects would collaborate with the band’s sound during the song. This put a new twist on crowd participation, and I took full advantage of the play time during both sets. After securing the spot and meeting our neighbors, I ventured off for a poster before it sold out. It is a nice print of barns stacked on top of barns that slightly resembles the barn that Trey and Phish record in. When the show started, the band opened up with “Dig Further Down” off of his 2008 album, The Green Sparrow. My daughter often demands to listen to this album at bedtime, so I am very familiar with these songs. 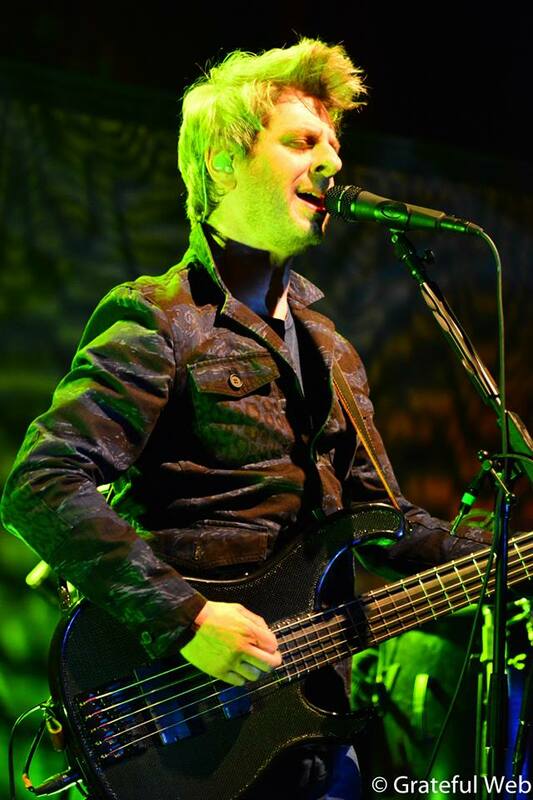 The band did not waste time playing a song that the crowd was definitely anticipating, “Yarmouth Road,” a song off of his new album Overstep and often played with Phish throughout their last tour. 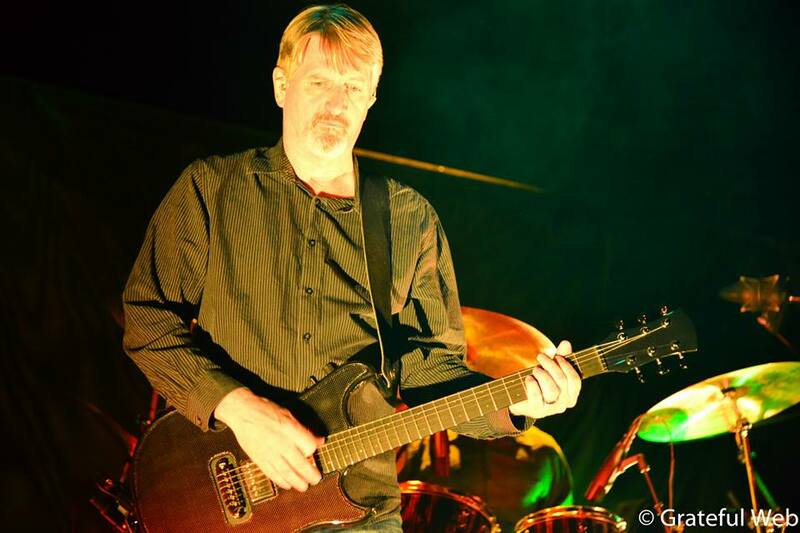 Guitar player and vocalist Scott Murawski, formerly from a jam band original Max Creek, played the voice box throughout the song, which gives the song a really interesting and unique sound. After a great bass solo by Cactus, the band went right into “Willow Creek,” which is a Max Creek song. Max Creek and Phish have a history together. They have played a show together in 1989, and Mike has sat in with them fourteen times over the years. The next song was an amazing dance number. It was cover of a Barika song from their second album called Rise. The song is called “Angatta.” If you have not heard of this funky West Africa sounding song or this band named after a part of Algeria, then you must look into it. And just like the night before at Toubab Krewe, percussionist Craig Myers broke out the N’Goni to pluck away at this flowing song. 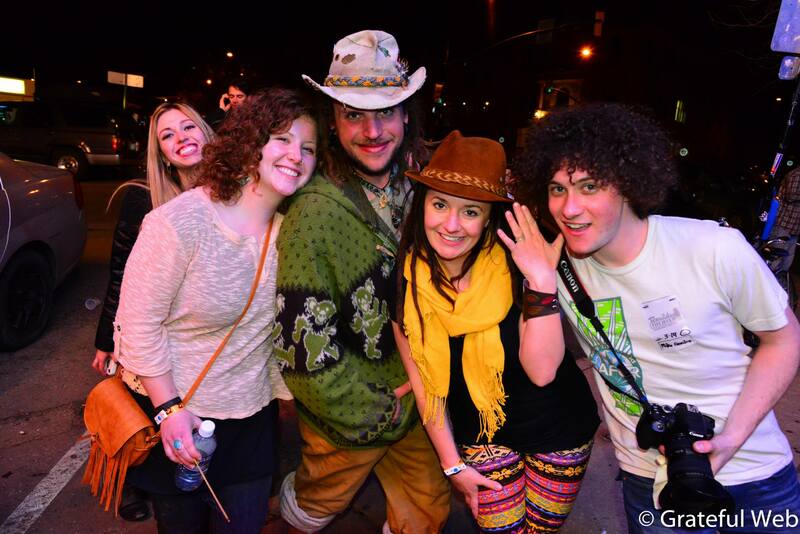 It sounds as if Phish’s “Tweezer,” was mixed into a West African jig. There were even parts of the song where Mike did an extreme African version of his “Punch You in the Eye” dance. During the N’Goni solo, Gordon and Murawski jumped as if they were on trampolines. Speaking of Phish, the band’s next song was a Phish rarity. Out of 154 shows, I have only seen “Spock’s Brain” twice. Most of the crowd did not even know the special moment that they were witnessing. Gordon was having so much fun that he was using airplane arms while singing the chorus. Pianist Tom Cleary teased “Theme from Star Trek” towards the end of the song as well. They played “Be Good and You’ll Be Lonely” next, which is one of the songs about Pretty Boy Floyd that Cleary wrote. Pretty Boy Floyd had a very interesting life. Cleary wrote a series of these songs for his Burlington, VT band Blue Gardenias to play, but this one is the only one played by Mike Gordon’s band. It is a very well told story in a series of songs about the infamous gangster. The front row played the light up keyboard percussion instrument on the stage during a jam, and then came “Long Black Line” from the new album. After, Mike said that he loves Boulder, and as he was walking around he noticed this light coming off of the mountains, and he called his family to tell them to come here. He emphasized his love for the shops, people, music, etc. of this great town. I swear, nearly every band that comes here says that about Boulder. This is the reason why I live here. It is an amazing place to live. Al Green’s “Rhymes” sang by Scott Murawski was next. This is a song that Mike’s band has played a bunch of times since 2008, but Green originally played this song during a tough time in his life. It is basically a break up song detailing the ups and downs of a bad relationship. I know many of you did not think it was possible for Al Green to even have a bad relationship because most of his songs are about getting together and “making nice,” but it happens to us all, and Green sang “Rhymes” during this time. I was also present when Phish covered the song in Massachusetts on 2011 summer tour. The last song of the set was another off of Mike’s new album called “Face.” He used some sound tricks during this song like when he hit a spot on his microphone, it made a scream type sound. 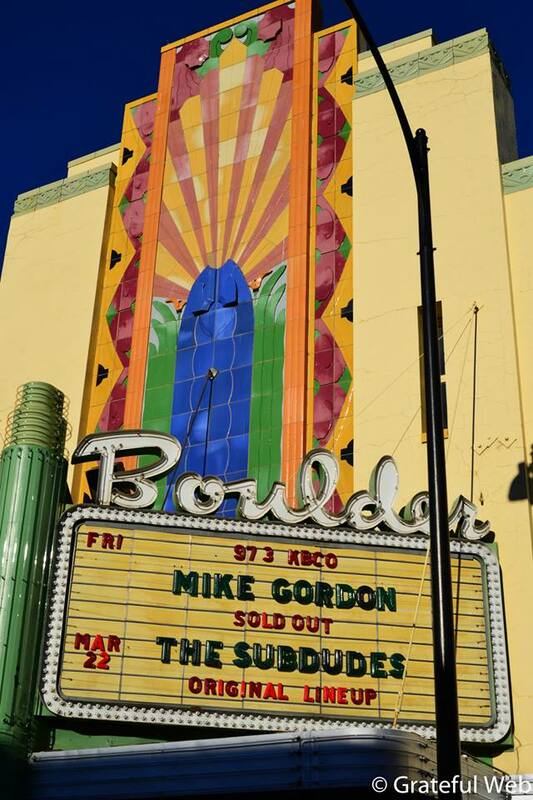 Gordon also used his signature rub down the neck of his bass, like he does during “Walls of a Cave.” It’s the bass sound that you hear in the song right after they sing, “Listen tooooooooo…” This concluded the action packed first set, and the sold out Boulder Theater was ecstatic. The second set started right where they left off with two songs off of the new album called “Different World” and “Ether.” During these songs, Mike played the opening riffs on a small guitar, and then at the beginning of “Ether,” he took out a drill and ran it up the neck on his bass strings and looped it. In the middle of the song, Gordon and Murawski read from a book for a minute. I recommend following Mike on Instagram because some of the things that he posts are hilarious. There is a book reading post that has me cracking up every time I watch it. Furthermore, Mike has a type writer at the merchandise table for his fans to type him notes. These are more of the reasons why Mike is so much fun to be a fan of. And what happened next proves this further. The array of songs into routine that came next was probably the highlight of the night. Even though it was not that big of a surprise, it was still wonderful to hear. “Meat” rang out while the crowd sang along, and after the Phish song, they played the opening song off of The Green Sparrow, “Another Door.” This went into the song “Fly” by Sugar Ray and then back into “Another Door.” The crowd laughed and sang at the same time, as this was the first time the band has ever covered “Fly.” “Peel” debuted at Newbury Comics acoustic in Boston earlier this spring, and this is a song that has a really great groove to it and a unique vocal cadence. Just then, they played only the first verse of “It Takes a Lot to Laugh, It Takes a Train to Cry,” the Bob Dylan cover off of Highway 61’ Revisited (1965). The only reason why that is unusual is because they have played the song in its entirety twice, but never just played the first verse. They must have audibled out of it to go back into “Peel” and then into “Hap-Nappy.” “Hap-Nappy” is one that took me back to my G.R.A.B. days. I’ll never forget that time. I mail ordered for the whole tour because I was so excited that members of Phish and the Grateful Dead would be touring at the same time with Marco Benevento and Joe Russo. But to my dismay, after about the fourth show, I realized aside from switching headliners and Trey sit ins with Phil & Friends, the shows were nearly the same. It was a legendary collaboration and idea anyway. During “Mrs. Peel > Say Something,” the front row had another chance to play the instrument on the front of the stage, if you were lucky enough to have it light up in front of you. After the super fun jam with the band, they played the type of song that everyone was waiting for, “Cities.” This Talking Heads cover that fans erupt for when Phish plays it did not disappoint, and the dance party was at its climax for the night. The last song of the set was the second song off of Overstep called “Tiny Little World.” The effect on the bass in this song is why people come to this show. It may be an envelope filter, but I’m not positive. It’s the same effect he uses on “Free” and “Boogie on Reggae Woman.” Most Phish phans will know exactly what I am talking about.